Home Glucose Optimization Did You Know Vitamin K-2 Helps Improve Blood Sugar Levels? If you’re a patient of mine, or you’ve been an avid reader of my newsletter, you know I hold vitamin K-2 in high regard. Vitamin K-2 is only starting to gain notoriety in the mainstream. Integrative MDs like myself have been advocating vitamin K-2 use for years now. But the community of mainstream practitioners is slow to get on board. However, the tide is shifting. And more and more physicians are becoming aware of just how useful vitamin K-2 is for helping to keep your bones and heart healthy. While I think that’s wonderful, I don’t want to shortchange vitamin K-2 here. There are quite a few additional reasons to consider adding K-2 to a supplement regimen. One of the most compelling reasons to take vitamin K-2 is research indicates it may help to improve blood sugar levels. A number of studies, which I’ll show you in just a moment, indicate vitamin K-2 could benefit blood sugar control. Combined with how K-2 keeps the heart and bones healthy I firmly believe vitamin K-2 may be one of the most underutilized nutrients on the planet! A few notes of importance here. The first note. Modern Americans are deficient in vitamin K-2. The reason is Americans have stopped eating foods naturally rich in vitamin K-2. Because most Americans rely on different kinds of food it’s lead to vitamin K-2 levels declining nationwide. Because vitamin K-2 levels are declining it shows why supplementation with vitamin K-2 is so important. And that brings about the second note. Supplementing with vitamin K-2 isn’t as simple as going to the store and grabbing a bottle. First off, many of the mainstream grocery stores don’t sell it. Which means you either need to go to a speciality store or order off the Internet to get it. There are two different kinds of vitamin K-2. There’s vitamin K-2 MK-4 and vitamin K-2 MK-7. Vitamin K-2 MK-4 is what’s found in most of the foods listed above (the exception being natto) and is typically the most popular form of supplementary K-2 because it’s cheaper. As I mentioned, MK-4 is the form of vitamin K-2 found in most dietary sources. The problem here is if you want to maintain healthy levels of vitamin K-2 it means your diet should consist of high intake of MK-4 rich foods. And that’s something not many people are capable of pulling off. Vitamin K-2 MK-7, on the other hand, has a much longer half life, which helps it absorb better and also leads to a quicker reversal of any kind of deficiency. Best of all is clinical studies show it only takes 150 micrograms of vitamin K-2 MK-7 to get the therapeutic benefit of K-2. On the other hand, it takes 45 milligrams of MK-4 to get the benefit. If you didn’t notice, the difference is micrograms versus milligrams – which is a whopper of a difference. All that being said, if you plan on taking vitamin K-2 to help improve blood sugar, you’d be wise from a cost perspective and a health standpoint to go with MK-7 over MK-4. Now, let me show you what the research says about taking vitamin K-2 and how it may improve blood sugar levels. In my professional opinion, if you want to enjoy robust, vibrant health, one of the best things you could ever do is keep your blood sugar levels within the healthy range. I believe the best way to accomplish that is through diet and exercise. But, as you just learned, the problem with many Americans and their diet(s) is they’re not getting enough vitamin K-2. And as research shows, the addition of vitamin K-2 into a person’s daily routine could help to improve blood sugar levels. For instance, in a double-blind study of 42 people aged 18-29, it was discovered that the individuals in the study had their blood glucose levels improve by taking 30mg of vitamin K-2 MK-4 (remember, this is the less potent form of vitamin K-2) 3 times a day. In addition to that, the vitamin K-2 enhanced other metrics commonly associated with healthier bones, which is a well documented use for vitamin K-2. In another study that lasted two weeks, men aged 18-29 who exhibited normal body types were given a blood glucose tolerance test. Individuals who were found to be deficient in vitamin K-2 initially, experienced improved blood sugar control with a single week’s worth of 90mg MK-4 supplementation. Those who had healthy vitamin K-2 levels initially were shown to have greater control over blood glucose levels and additional vitamin K-2 supplementation didn’t improve their insulin sensitivity. Which means that having a healthy level of K-2 in the body was all that was needed to help keep blood sugar levels healthy. Research has shown vitamin K-2 MK-7 helps increase insulin sensitivity in an extraordinary way. What they’ve observed is it might regulate your blood sugar by converting a substance called Undercarboxylated osteocalcin (ucOC) into something known as carboxylated osteocalcin. A 2011 study on human subjects, published in Diabetes Care, showed when Undercarboxylated osteocalcin (ucOC) is transformed into osteocalcin it improved insulin sensitivity and helped metabolize glucose at a greater rate. The enhanced glucose metabolization is believed to keep blood sugar under control and may help prevent future, dangerous insulin spikes. Since that original study was conducted at least 4 more studies have shown taking vitamin K2 helps to improve blood sugar levels. If you’d like to add vitamin K-2 MK-7 into your diet to keep blood sugar levels safe, you don’t need to do much. As I mentioned, the clinically tested dosing for vitamin K-2 MK-7 is 150 mcg. This is why I’ve custom formulated our vitamin K-2 MK-7 to hit that exact dosing. To help improve your blood sugar levels all you have to do is take one capsule of K-2 MK-7 daily. Combine it with berberine and magnesium and you’ve got the ultimate, natural blood sugar combo. 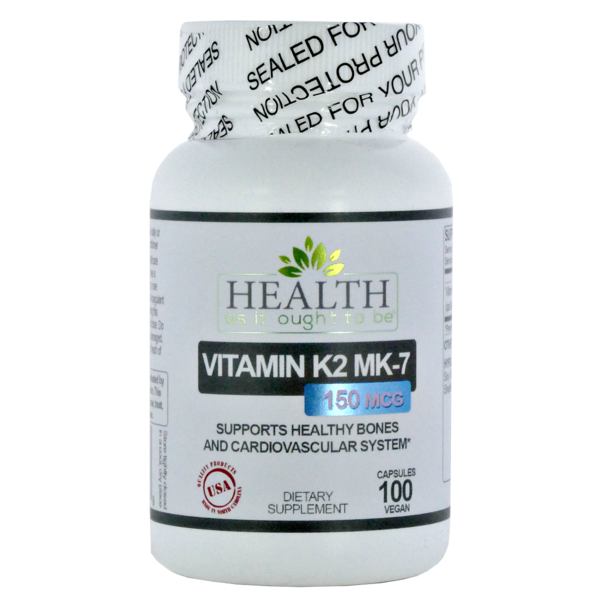 If you’d like to get our vitamin K-2 MK-7 for blood sugar all you have to do is click this link or the image below. Vitamin K-2 MK-7 is an absolute must for perfect health.